When I was a little girl, two of my favorite things in the world were rocking back and forth on my rocking horse and rocking in my little wooden rocking chair which had a small music box you could wind up to play music as I rocked. My 13 month old little niece has an adorable rocking horse that is the best of both of these. It is the cutest rocker I have ever seen and not only is it fun - it is also educational. It is a Lady Bug rocker/rocking “horse” which plays music and she absolutely loves it. bug rocker has a round yellow head with black eyes and mouth, with long black eyelashes. The cheeks are red and she has two lime green pigtails with a pink bow on each pig tail. The body is made of all new material consisting of 100% polyester fiber and foam. Over the filling is a big soft red furry body with black polka dots, just like a real ladybug. The belly of the ladybug is yellow. The red and black body is what envelops the rocking chair seat/rocking horse. shoe. The head has a wooden handle on each side for the baby to hold on to as she rocks. All that is necessary to keep the ladybug clean is to surface wash her with a damp cloth or sponge. The best thing about the ladybug is she doesn’t just rock. On her head she has four buttons you can push to play different songs. The first row has a round blue button which plays a song about rainbows. Next to it is a green square button which plays a song that teaches the alphabet. There is one more row of buttons. The first one is a red triangle and it plays a song which teaches numbers. Next to it is a yellow star button which plays a different song about numbers. My niece can push the buttons by herself and she loves to play the songs over and over while I rock her on her ladybug rocking horse. She has already discovered that if she plays a song, and changes her mind - she can push the same button again and the song will stop playing. Then she can play a different song. even know her alphabet and numbers before she even turns 2! The only con I have regarding her ladybug is sometimes when I am rocking her she tries to climb off while the ladybug is still rocking and I am afraid she will get hurt. I am trying to teach her to let me know when she wants to get off so I can stop the ladybug rocking and help her get off. I wish that her ladybug had been made with a safety strap attached to it so I could strap her in and she would not be able to get off while her ladybug is still rocking. 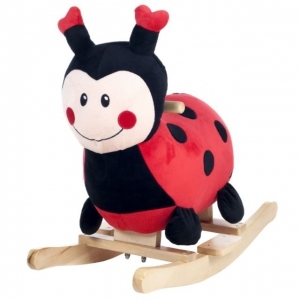 Other than this, I think her ladybug rocker is awesome and would highly recommend it.